Gokyo Everest Base Camp Trek offers you a chance to visit Gokyo Lake, Everest Base Camp, Kalapathar and Sherpa villages of Namche and Lukla. The first part of the journey takes you on a rugged trail to one of the highest lakes in the Everest region, Gokyo Lake (4790m). Climb Gokyo Ri (5340m) early morning before joining the Gokyo lake trial on a challenging cross of Cho La Pass (5420m). The journey continues towards Everest Base Camp (5340m) followed by a climb of Kalapathar (5545m) which affords an exclusive, upclose views of Mt. Everest, Mt. Lhotse, Mt. Cho Oyu etc. The trail moves ahead until it reaches Namche village, the home of Sherpa people, where you can spend time unwinding yourself by visiting local bars, observing local lifestyles, tasting local cuisines and shopping. 00.00 am: Arrive at Kathmandu from your country. 00.00 pm: Pick up from airport, and proceed to hotel to check in. 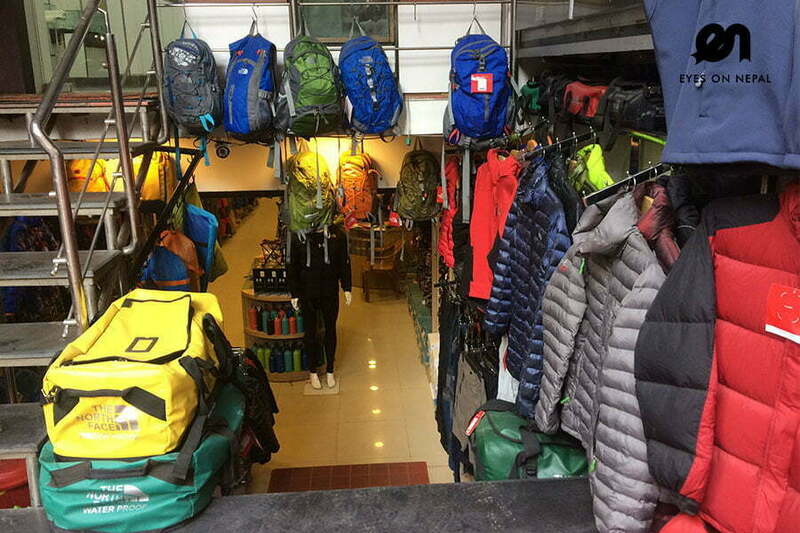 *** Meet with our trekking guide and we will brief you on trekking necessity, and checking on your trekking gears before departs to Lukla the next day. Highlights: Starting your Gokyo Everest Base Camp Trek with Thrilling air journey to Lukla. 07.00 am: Breakfast at the hotel. Check out hotel. 08.00 am: Start the trek after breakfast to TokTok (2760m) for 1 hour. 09.00 am: Arrive in Toktok(2760m) and continue the trek to Bengkar(2710m) for 30 minutes. Note: You can see Thamserku(6618m) mountain on your right hand sight. 09.30 am: Arrive in Benker(2710m). From Bengkar, you can see the view of Thamserku(6618m) on front right. Continue the trek to Monjo(2840m) for 1 hour. 10.30 am: Arrive in Monjo(2840m). You can see the KhumbilaPeak(5765m) from Manju. Buddhistsbelieve that it is the holy Himalaya and restricted to climb. NOTE: We will registered and buy the Sagarmatha (Everest) National park entry permit here(Included in fees charged), we then continue the trek to Jorsalle (2810m) for 30 minutes. 11.00 am: Arrive in Jor Salle (2810m) and lunch. 11.30 am: Start the trek after Lunch to Hilary Bridge for 40 minutes. 12.10 pm: Arrive in Hilary Bridge and start uphill trek to Namche(3440m). Will test your fitness. 03.00 pm: Arrive in Namche Bazar(3440 m). Check in hotel, Enjoy the scenic Namche Bazar and splendid view of Kongde(on front), Kusumkhan and Thamserku(at back). Dinner and overnight in Namche. Hiking to Everest View Hotel(3900m). It is 2.5 hrs uphill treks. Rest and explore the area. This point offers beautiful views of Kwangde, Thamserku, KusumKanguru, Kangtega, AmaDablam, Island Peak, Peak 41, Lhotse, Lhotse Shar, Nuptse, Everest, Tabuche peak, Cholatse peak, Khumbila etc.. NOTES: Back to hotel. Breakfast, lunch& dinner in hotel. NOTES: Every Friday and Saturday, do not forget to visit the local marker fair to shop for goods on cheap price. 07.00am: Breakfast at your lodge. 08.00am: Start trek to Dole. 09.30am: Arrive in Kyangjuma(3570). You can have good view of Ama Dablam, Thamsuekur and Khantega etc and contine the trek Sanasa(3650m). Here you will have two routes. Right turn will go to Everest Base Camp to so you will take left one. 11.15am: Arrive in Mongla Danda(3970m). Note Sanasa to Mongla Danda is uphill trek. You will have good view of Cholatse and Taboche. YOu will have your tea break for 15 minutes. After tea break, continue the trek to Phortse Tenga(3680m). It is down hill trek and takes about 1 hour. 01.00pm: Arrive in Phortse Thenga and have your lunch break. 02.00pm: Continue the trek after the lunch break to Dole(4110m). It is uphill trek for 2 hours. 04.00pm: Arrive in Dole and overnight in the local lodge. Note: Dinner at the hotel. 08.00am: Start the trek to Machhermo. 09.30am: Arrive in Lhafarma(4330m) and continue the trek to Luza. 10.30am: Arrive in Luza(4360m) and have your tea break here for 15 minutes. After the tea break continue the trek to Machhermo. 12.00pm: Arrive in Machhermo(4400m). Overnight in Local lodge. Note: Lunch, dinner and breakfast will be provided at the hotel. Description: Machhermo is the last huge human settlement area on the way up to Gokyo. You can visit Himalayan Rescue Hospital for a lesson regarding the altitude sickness, its precaution, and primary treatment. NOTES: Locals believe that they have spotted Yeti(Snow man) on 1974 at Machhermo. NOTES: Lunch and Dinner at the hotel. 07.00 am: Breakfast at the hotel. Check out hotel. 08.00 am: Start the trek to Pangla(4480m). On the way you will see beautiful valley and Mt. Kangtega, Thamserku, and northern part to the Cho-Oyu (8153m). NOTE: Phangla is the palace where 40 people killed by an avalanche in 1995. We continue our trek to river bank. 11.00 am: Arrive in Riverbank, cross the metal river bridge and touch the Gokyo land. Welcome to Gokyo. After some uphill trek you will face First lake of Gokyo (Longpunga Tso) and continue uphill trek through stony steps to second lake of Gokyo(Taujung Tso). 12.30 pm: Arrive in Taujung Tso or Second lake. NOTE: It is blue clear sparkling water lake. We continue with stone steps trail, trek to 3rd lake of Gokyo – Gokyo Tso 4734m. 01.30 pm: Arrive in 3rd Gokyo Lake. Overnight at local lodge at Gokyo Lake. NOTE: Lunch and dinner will be at lodge. Rest and relax. You can make good photographs around Gokyo Lake. 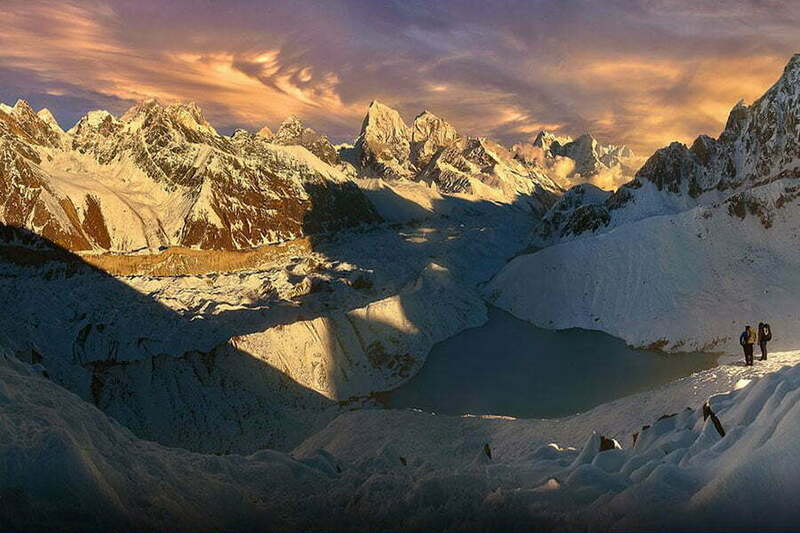 NOTE: OPTIONAL Trek- You can go up to Gokyo Ri (5360m) or 5th lake for good sunset view in the same day. 06.00 am: Breakfast at the hotel. Check out hotel. 07.00 am: We start our trek to Fifth lake. 08.30 am: Arrive in fourth lake of Gokyo (Thonak Tso 4870m) and continue the trek to fifth lake. 10.00 am: Arrive in fifth lake of Gokyo(Ngozumba Tso 4998m). You will see amazing views of North and South slopes of Everest. You will see the trail that extends towards Cho Oyu Base Camp at the fith lake and views of longest Glacier in Nepal called Nogunzpa Glacier. After spending some times by taking some pictures of lake, glacier and Everest, you will return to hotel. 01.00 pm: Arrive in hotel. NOTE: Lunch and dinner at the hotel. 04.00 am: Start the trek to Gokyo Ri. 07.00 am: Arrive at the summit of Gokyo Ri(5357m). 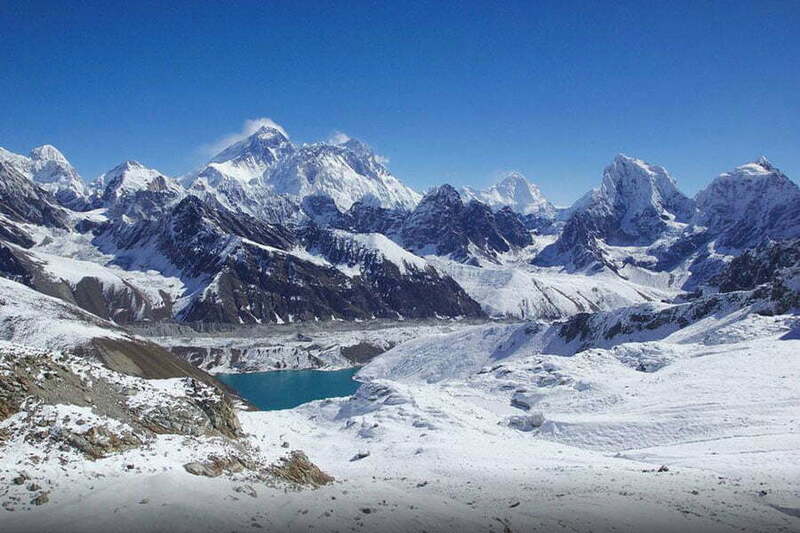 You will see the view of Cho-Oyu, Gyachung Kang, Everest, Lhotse, Nuptse, and little bit of Mt. Makulu . After taking some picture we trek back to Gokyo lake. 08.00 am: Arrive in your hotel and have your breakfast in the hotel. 09.00 am: Start your trek to Thangnak(4700m). 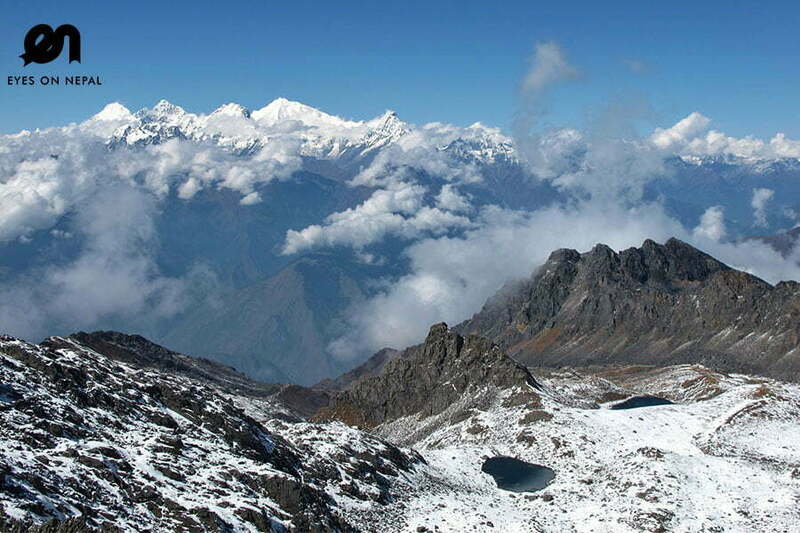 After 30 minutes up and down hill treks, you will cross the the Ngozumpa Glacier and continue the trek to Thangnak. 12.00 pm: Arrive in Thangnak and Rest and Relax. NOTE: Lunch and dinner at the hotel. 04.00am: Have your breakfast at your hotel 05.00 am: Start the trek to Chola Pass (5420M) along the rocky trails and glacial moraines to the top to the pass. The final 300 meter up to the Chola Pass is difficult and technical walk. So, please listen and follow the instruction of your guide carefully. 09.00 am: Arrive at the top of Chola Pass. You can see the amazing view of mountain and passes from here. After taking some photographs, we continue our downhill trek to Dzangla. 01.00 pm: Arrive in Dzangla and stay overnight at local lodge at Dzangla. Note: You may find slippery icy downhill trek. Highlights: Amazing view of Mountains. 06.00 am: Breakfast at the hotel. Check out hotel. 07.00 am: Start our trek to Lobuche. After some easy downhill and few up and downhill walking along rocky trail, you will arrive at Lobuche(4910m). 01.00 pm: Arrive at Lobuche, check in. NOTE: Lunch and dinner at the hotel. 06.00 am: Breakfast at the hotel. Check out hotel. 07.00 am: We start another long day trek of our jouney. You will walk along rocky trails.During your trek to Gorakshep you will see amazing view of Mt. Everest,Mt. Nuptse,Mt. Pumori and Khumbu Glacier. 10.00 am: Arrive in Gorakshep(5164m). we will drop our backpack at the hotel. After some light meal we will continue our trek to Everest Base Camp(5365m). 03.00 pm: Arrive in Everest Base camp. You will see the amazing views of Nuptse, Khumbuste and Mt. Pumori. Take the picture and feel yourself how nice it would be if you can trek further up to summit. After spending some memorable times, we will trek back to Gorakshep. 06.00 pm: Arrive in Gorakshep. Dinner at the local lodge. Have a good night rest after dinner. Highlights: Amazing view of Mt.Everest . 04.00 am: Wake up and uphill trek to Kalapatthar(5545m) for 2 hours. NOTE: You can see beautiful sunrise view and mountain likes Everest, Nuptse, Mt Pumori, Amadablam etc. We will rest for 30 minutes. 06.30 am: Start downhill trek back to Gorakshep(5164m). Heading down is easier and the pace is fast. You will walk with great memories and good feelings. 07.30 am: Arrive in Gorakshep and have breakfast at your hotel. 08.30 am: Start downhill trek back to Pheriche (4280m). 10.30 am: Arrive in Lobuche (4940m) and continue the trek to Dughla (4600m) for 2 hours 12.30 pm: Arrive in Dughla and Lunch at Dughla (4600m). 01.00 pm: Start the trek to Pheriche (4280m) for 2 hours. 03.00 pm: Arrive in Pheriche (4280m). Check in hotel and Overnight in Pheriche. Dinner at hotel. 08.00 am: After breakfast, start trek to Shomare(4070m) for 1 hour. 09.00 am: Arrive in Shomare (4070m) and continue the trek to Pangboche(3930m) for 45 minutes 10.00 am: Arrive in Pangboche and continue the trek to Deboche(3770m) for 45 minutes. 11.00 am: Arrive in Deboche and continue the trek to Tengboche(3860m) for 30 minutes. 11.30 am: Arrive in Tengboche and have your lunch at Tengboche. 12.30 pm: After lunch start your downhill trek to Namche. 03.30 pm: Arrive in Namche Bazar. The most commercial place in Everest region. You can visit the village after check in at your lodge. Dinner at the lodge/hotel. 08.00 am: Start the downhill trek after breakfast to Hilary bridge for 1.5 hrs. 09.30 am: Arrive in Hilari Bride and continue trek to Jorsale(2810m) for 30 minutes 10.00 am: Arrive in Jorsale (2810m) and continue the trek to Monjo(2840m) for 30 minutes. 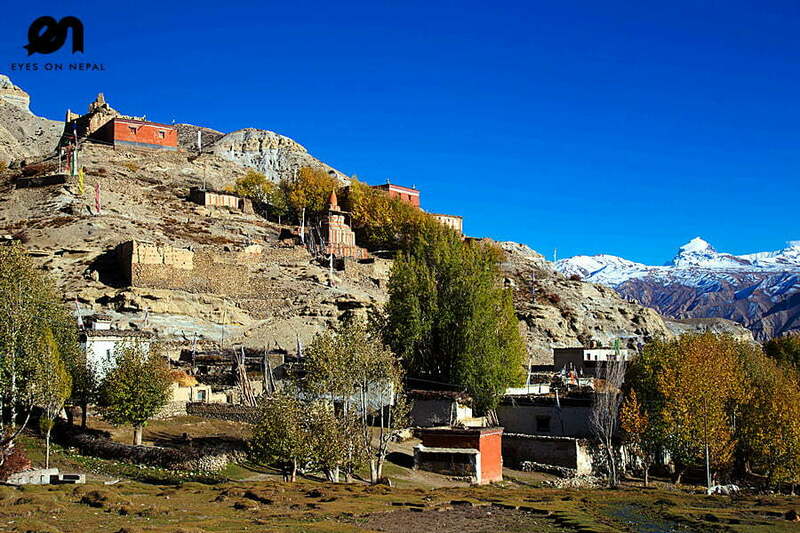 10.30 am: Arrive in Monjo (2840m) and continue the trek to Bengkar(2710m) for 30 minutes. 11.00 am: Arrive in Bengkar (2710m) and continue the trek to Toktok (2760m) for 30 minutes. 11.30 am: Arrive in Toktok (2760m) and continue the trek toPhakding (2610m) for 45 minutes. Lunch at Phakding(2610m). 01.00 pm: Start the trek to Ghat(2590m) for 1 hour. 02.00 pm: Arrive in Ghat (2590m) and continue the trek to Chheplung(2660m) for 30 minutes. 02.30 pm: Arrive in Chheplung (2660m) and continue the trek to Lukla for 1.5 hours. 04.00 pm: Arrive in Lukla (2840m) and check in hotel. Overnight in Lukla. 05.30 am: Wake up and go to Lukla Airport to take the flight to Kathmandu. We expect to arrive in Kathmandu airport around 8.30am. 09.00 am: Pick up from Kathmandu Airport and drive to your hotel for check in. 09.30 am: Arrive in hotel, Check in. Breakfast at Hotel. Free and easy all day. 05.30 pm: Pick up from hotel for dinner. Note: today, we will take you to dine your choice of food. It is your party dinner after successful trek. Enjoy the dinner and drinks. 09.30 pm: Back to hotel. Congratulation. Trek ends. USD 1600 per person (Minimum 2 to go) NOTE 1: The price above is quoted based on 2 people. If you are travelling in a group of more than 2 people, kindly write to us at sales@eyesonnepal.com , we will give you a special quotation. We will reply you with an official quotation with itinerary. If you are okay with our itinerary and quotation, confirm with us in email. 2) We will issue the Confirmation Order and Invoice to you. 3) You need to send us the following mentioned documents to prepare the TIMS & Sagarmatha National Park Entry Permit. 4) 50% deposit will be paid by your side either via Pay Pal or bank in to our Nepal Company account, 50% outstanding will be paid upon pick up. We will issue the official receipt to you once we received the payment. Upon pick up, we will check your trekking gears, and will pass you the TIMS and Sagarmatha National Park entry permit. 5) Welcome to Nepal. We will greet you upon pick up in your hotel.